Having lived in Halifax and not to far from Enfield, i knew of the great peanuts that come from this area. The Roasted Redskins are my #1. I buy them all the time and have never had a bad one. Please continue to furnish the best peanut in the world. My husband and I just love these redskins! We have purchased these nuts for the past 3 years at the Holiday Mart in Greensboro NC. We love them so much that I decided to order online and not just wait for the Holiday Mart! Best nuts I have ever tasted. Best i ever had. Best i ever had. Best i ever had. 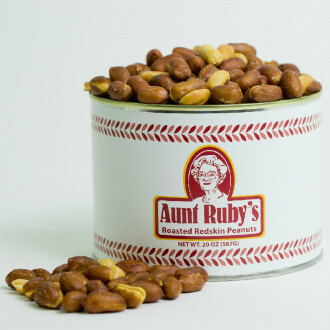 Aunt Ruby's large Roasted Redskin Peanuts are simply the best peanuts I've ever tasted. They have an amazing freshness and strong peanut flavor. They also aren't over-salted like so many nuts are. Really a great product! Best peanuts I ever ate! I've eaten a lot of nuts in my life, and these are the best in the world. I have had the country style gourmet peanuts and the roasted redskin peanuts. They are without a doubt, the best peanuts I've ever tasted. 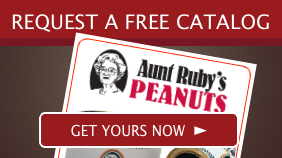 I've been buying Aunt Ruby peanuts for more than 20 years. Without question they are the best. We really enjoy the redskins and all the others. Aunt Ruby's Peanuts are the best! My father loved the peanuts and I picked up the tradition from him. He has passesd now and the peanuts remind me of good memories with him. No other peanuts taste as good. I also store mine in the freezer to keep it fresher. I guess I am a peanut freak. I just love them, like it is almost an addiction. It's impossible to have just one serving. I went to the Southern Christmas Show in Charlotte nc, and came across these aunt ruby's redskins. I am hooked. They are so good. I am getting on this website to order another stock. Best Redskins I have ever purchased! My first encounter with Aunt Ruby's was at the Holiday Market in Greensboro nearly 3 years ago. The roasted red skins are by far the best tasting peanuts that I have ever tasted. Each can tastes as if they we're fresh roasted that day. I look foreward to stocking up each year. Having searched the world over, this is the best you can ever hope to find! I am a cardiologist and cholesterol specialist who incorporates a lot of nuts in my diet. I have ordered various nuts from many sources online and these are some of the best that I have found.